What do I need accomplished? To make the right choice, as the client, you need to really know what you need before you can know who you are looking for. If your main need is pure design, meaning getting someone to pick out colors, visuals, and fonts, a designer may be the best route. This is not to short change designers skill sets at all, but designers traditionally are designers because they love to labor over the details of design more than execute a marketing strategy. And in the end if you have a good designer there will be a lot of love put into your project. If your designer has a deep understanding of your industry they can provide a very focused effort, but this can also be a bit limiting if you have an array of products or services. If you are looking to do some higher level problem solving with a focus on strategy, then an agency is the best solution. Agencies exist to solve marketing problems. Your agency will most likely employ designers, writers, strategists, etc… to work with you. An agency can be the think tank bringing you the higher level strategy while combining ideas and design. An agency has multiple team members working on your account, which means more brains on the job. How involved do I want to be in the process? A typical design project is you asking for a thing to be accomplished. Create a sale sheet. Produce an ad. Design some web banners. Designers literally make a living doing these types of things. And they typically do them well. The up-side is your project should look fantastic when you are done. The down-side is you might get in the weeds with the details. If you have a little more time and enjoy being close to a project, then a designer might be a better fit. If your style is more hands-off, then an agency might be a better way to go. Agencies like to get assignments and deadlines, go off and work, and bring back solutions. When you hire an agency, you are hiring people to make some decisions for you. You get to look at the bigger picture and make sure the work is up to snuff. How and how much do I want to pay? Hiring a designer usually means one thing: hourly. If you hire a freelance designer it’s on an hourly rate. If it’s full time, then you are buying 40ish hours a week. Either way, it’s usually not a performance model. However, freelance designer hourly rates are usually less than agency hourly rates. If you’re hiring an agency, you may have options. Almost all agencies will work on an hourly model or a monthly fee. And some agencies will work on some kind of performance model. It might be a hybrid fee/bonus, or very rarely a full commission basis. A commission model guaranties your agencies goals and your goals are tightly aligned. If you want to be highly involved in the details – hire a designer. More delegation of responsibility – hire an agency. If you have more time than money – look for a designer. Less time and more money – look for an agency. If you just need great design – get a designer. 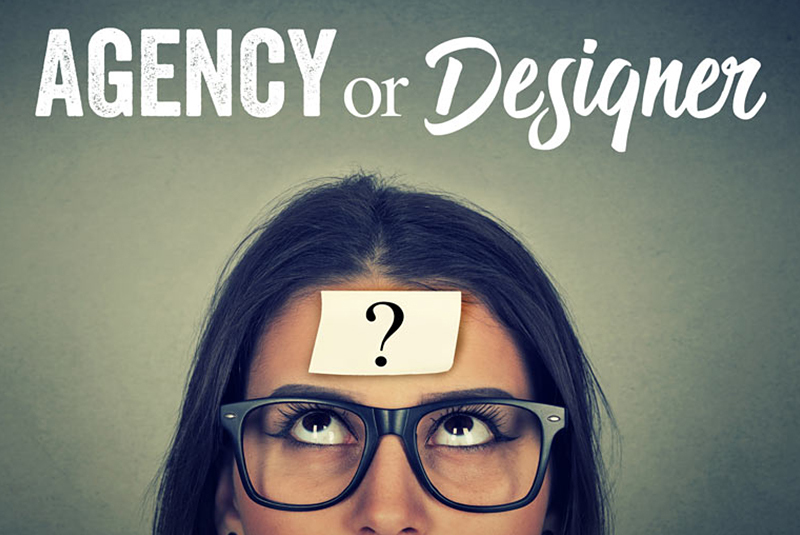 If you need design and strategy – get an agency.